It's the most wonderful time of the year... because it is cold outside and you can make lots of winter accessories! I knew that it would be odd if I didn't make little Lucky a hat for Christmas. 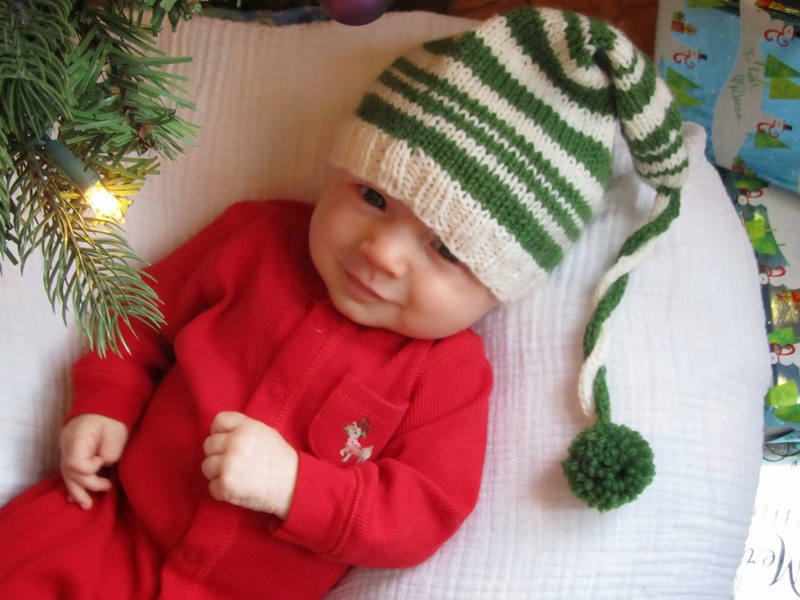 I searched around for the perfect elfish hat, and was thrilled when I came across the Red, White, & Ewe Santa Hat. This adorable striped hat comes calls for casting on 70 sts and then knitting in 2x2 ribbing. 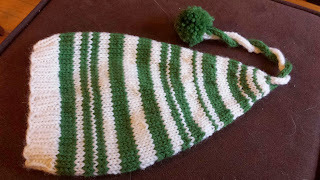 This sizing should work great because the pumpkin newborn hat had 60 sts, and while it still fits 8 week old lucky it is getting a little short. 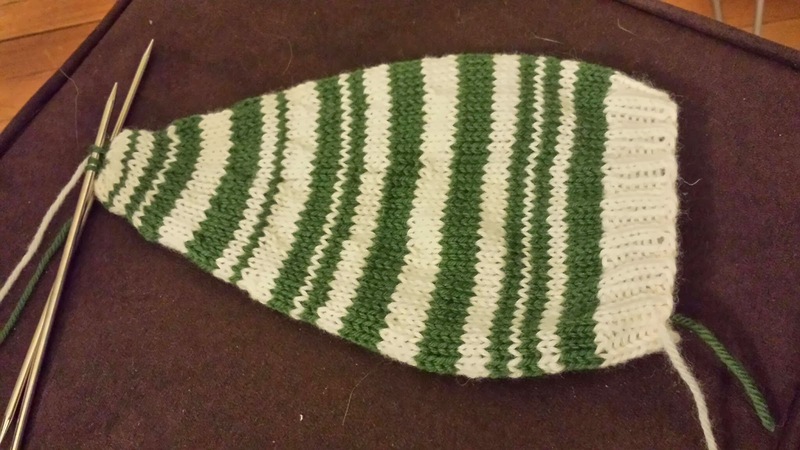 The turkey hat had 64 sts cast on. 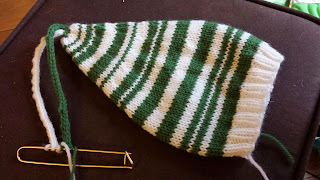 However someone commented that this requires multiples of 4, so I cast on 68 stitches for my hat and then only decreased 8 sts on the first decrease round to get to 60 sts. 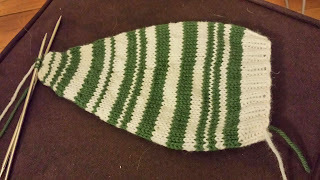 Unfortunately the pattern doesn't provide the cool uneven striping pattern they showed, so I'll share the striping pattern I used below. 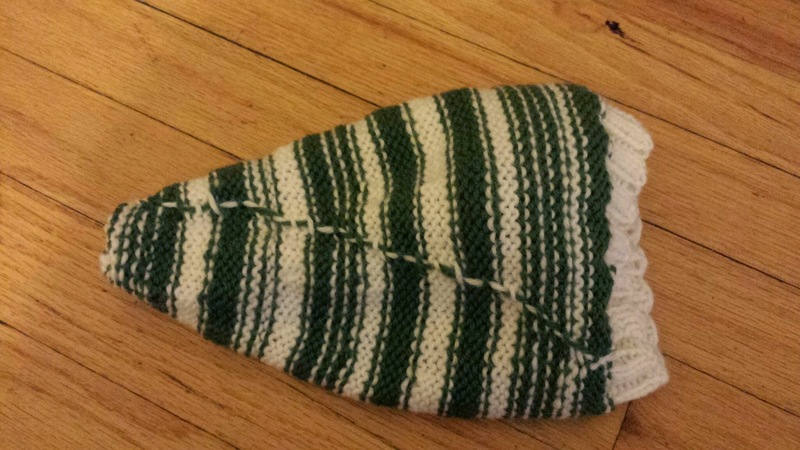 I wanted to make my striping joggless (so you don't see where the rows began.) I achieved this by using the traveling joggless stripe method. Ribbing - all white. 7 rows, just over 1" in length. 4 white. Measures a bit over 4". Start decreases on the next green round. 4 green. *K6, K2tog, K7, K2tog. * across for 60 sts. This is decrease round 1, follow the rest of the pattern as written. 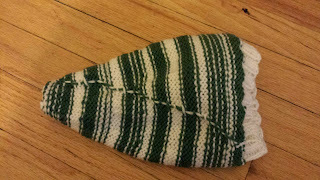 The base of the hat is 10" long, tassels are 6.5" long. 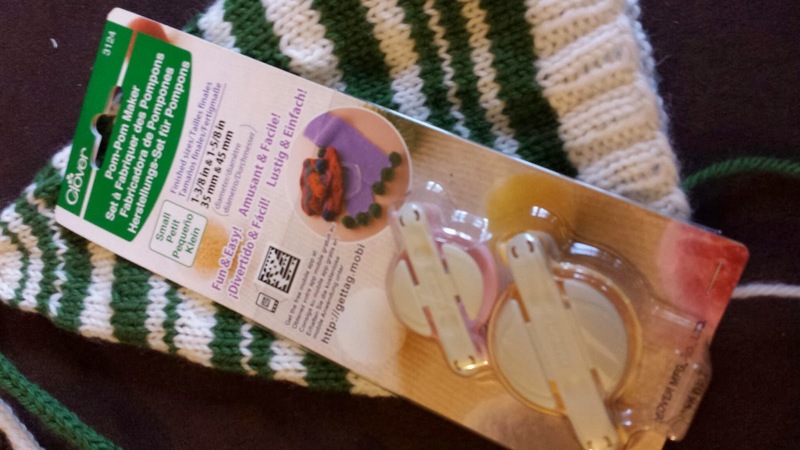 I have never used a pompom maker, I've always used cardboard or something that I cut out myself. I purchased these pompom makers specifically for this hat, hoping that they would make the whole process easier. I chose the 1-5/8" diameter. I twisted the two i-cords around each other and then tied the ends together. They will stay twisted because I wrapped them around each other rather than twisting them together. 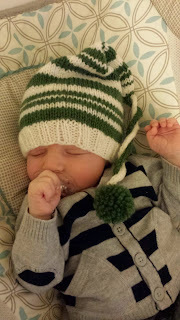 I then tied the pompom onto the ends, and Voila, a lovely little elf hat for my little Lucky. I'm not sure I'll be able to make Lucky a special hat for every holiday, but I know that I'll try as long as I can! And what would you know, Google+ autoawesomed Lucky's picture! Enjoy the sparkles!